In this spotlight on the lakeshore, read how top performers from several open-mic sessions will play a special showcase this weekend — and share in ticket proceeds from the event. 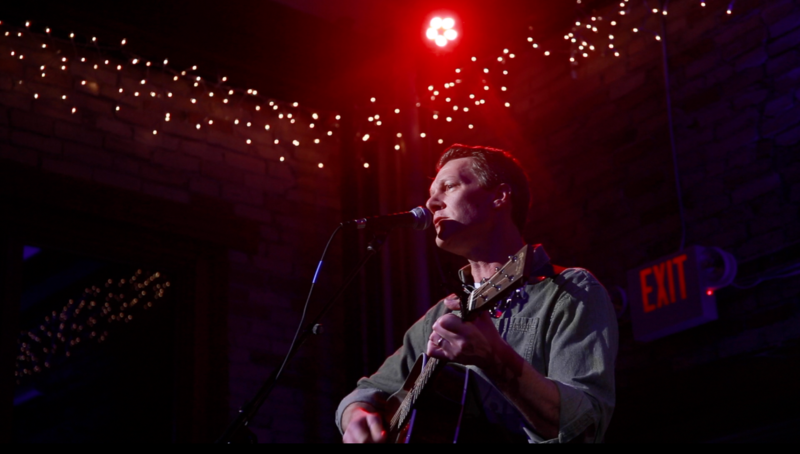 Open-Mic Magic: Host/singer-songwriter Loren Johnson performs at Seven Steps Up at an open-mic session. Consider it a tantalizing twist on the usual open-mic night experience. After four successful sessions of monthly open-mic nights at Spring Lake’s Seven Steps Up, the top performers will re-appear there for an encore concert on Sunday. 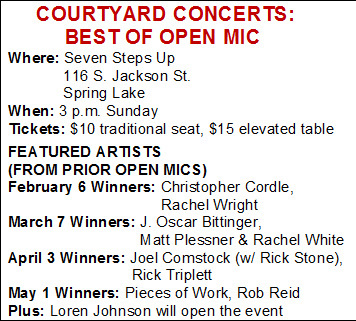 The top performers from Seven Steps Up’s popular open-mic series will perform in a 3 p.m. Sunday “Best Of Open Mic” showcase. Tickets are $10 for reserved seating and $15 for reserved table seating, and are available online at pindropconcerts.com. “Best of Open Mic” performers will share in the ticket proceeds from this event. “From what I’ve gathered, people just absolutely love it,” said open-mic host and singer-songwriter Loren Johnson. During the four monthly open-mic sessions this year, performers were split into rounds by a random drawing. After the event, Johnson and Michelle Hanks, Seven Steps Up owner and president of Courtyard Concerts, the venue’s nonprofit arm, selected two winners. Those singers were invited to perform at the “Best of Open Mic” showcase on Sunday. 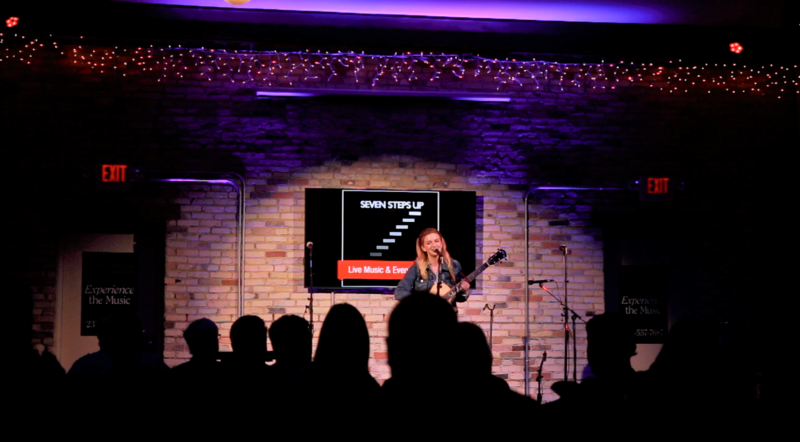 Johnson said guests and performers alike seem to like the listening room-style setting that Seven Steps Up offers – as well as how wonderfully the audience treats each performer. Johnson calls Hanks and her husband and business partner, Gary Hanks, true lovers of music. So when Courtyard Concerts approached Grand Haven’s Walk The Beat organization to sponsor open-mic night events and asked Johnson to host the sessions, Johnson was happy to be involved. In the Spotlight: Performers at Sunday’s special event will share in ticket proceeds. “Word-of-mouth, posters, and especially social media have been amazing. But what I think really got the word out about our events was the musicians and participants themselves,” Johnson said. Michelle Hanks said the open-mic sessions far exceeded their expectations. Even after Sunday’s showcase, that story will continue, with a new season of Courtyard Concerts’ open-mic sessions already in the planning stages. “The entire experience – from hosting, to watching it grow, and seeing the way it’s created a community, and boosted artists’ confidence, has been incredible,” Johnson added. In addition to performers splitting proceeds from ticket sales for Sunday’s event, there will be a “donation bucket” for contributions, with these proceeds split equally between Courtyard Concerts and Walk the Beat. 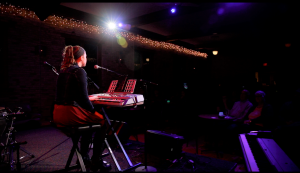 Check out the Local Spins Guide and Listing to Open-Mic Nights in West Michigan. More people are reading Local Spins than ever before, but in order to keep things spinning and enhance coverage of West Michigan’s music scene with the stories, photos, videos, reviews, podcasts and other features, we need your help. Many websites have put up paywalls to help finance their work. We haven’t. But as part of a Local Spins community of folks invested in showcasing Michigan-bred talent, we’re asking our readers to consider supporting Local Spins and what we do. Those providing gifts at any level, whether it’s $5 or $50, will have their names listed in the Local Spins Hall of Fame. For $50 or more, you will receive a copy of the first-ever “Local Spins Live at River City Studios” CD and a gift card to a local brewery. (The CD will be available after May 25.) Thank you for joining the Local Spins family and helping us cover West Michigan’s burgeoning music scene. Click here to donate to Local Spins (and to receive your CD and gift card)!